Aimed at the budget-minded consumer who doesn’t want to sacrifice performance, the Corsair Carbide 500R will be put to the test today. Part of Corsair’s latest case line, the Carbide series includes the great cable management, easy drive mounting features and solid airflow that we’ve come to expect from Corsair. 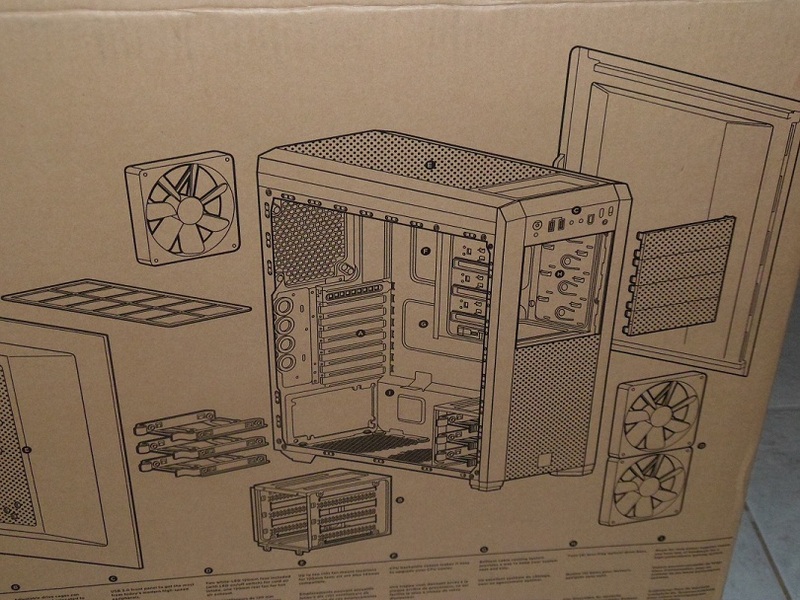 The 500R comes packaged in the standard Corsair box with an ‘exploded image’ of the case on one side and description on the other. We can see on the exploded image the stock cooling, which includes a 200 mm white LED fan side fan (not shown), two 120 mm white LED fans, and a 120 mm black fan. The box is black ink on unprinted cardboard. 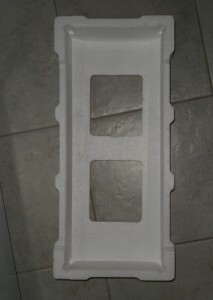 The case is packed securely inside with two thick pieces of Styrofoam and wrapped in a thick plastic bag for shipping. The case itself feels quite sturdy. Fit and finish are exceptional for a case in this price category. The metal is not powder coated and has a soft feel. 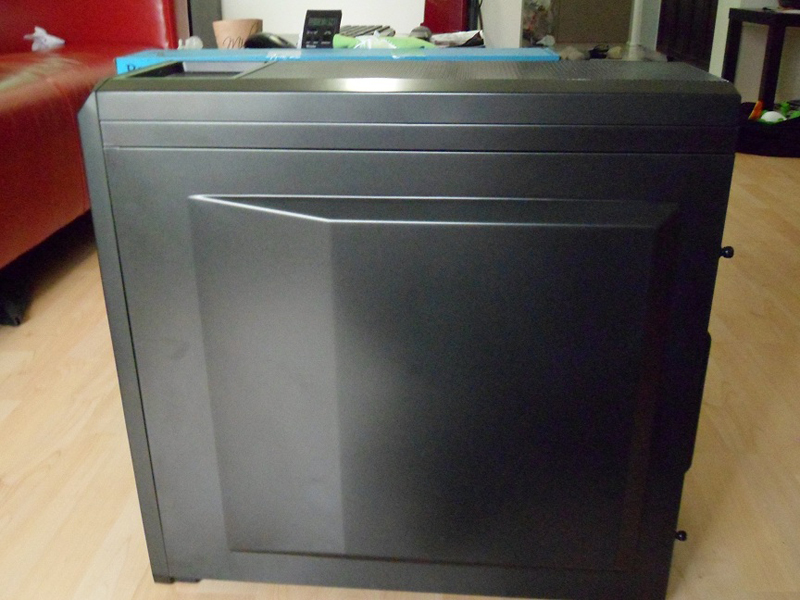 The sides of the front bezel and top of the case are black plastic. The rest of the case is steel and steel mesh. The 5.25″ bays are steel mesh with a foam air filter. 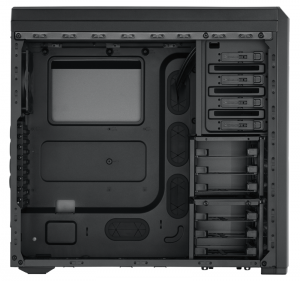 Although the case includes four fans, which are sufficient for any average system, Corsair allows for up to 10 fans to be mounted to this case. 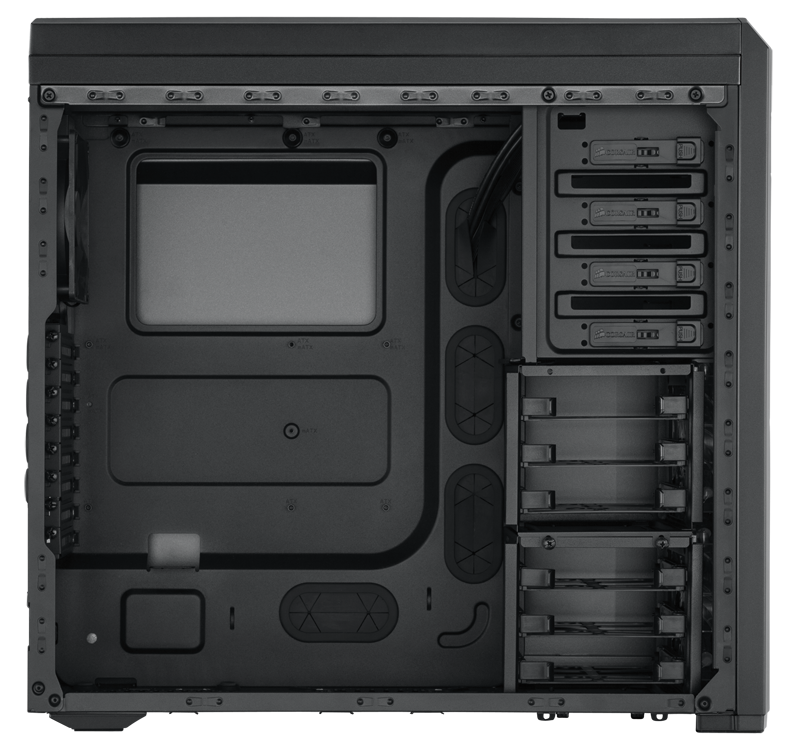 Two 120 mm fans up front, four more 120 mm fans can run push/pull on the HDD bays, two 120 or 140 mm fans on the side panel, a 120 mm in the rear, two 120 or 140 mm fans up top, and a 120 mm in the floor. 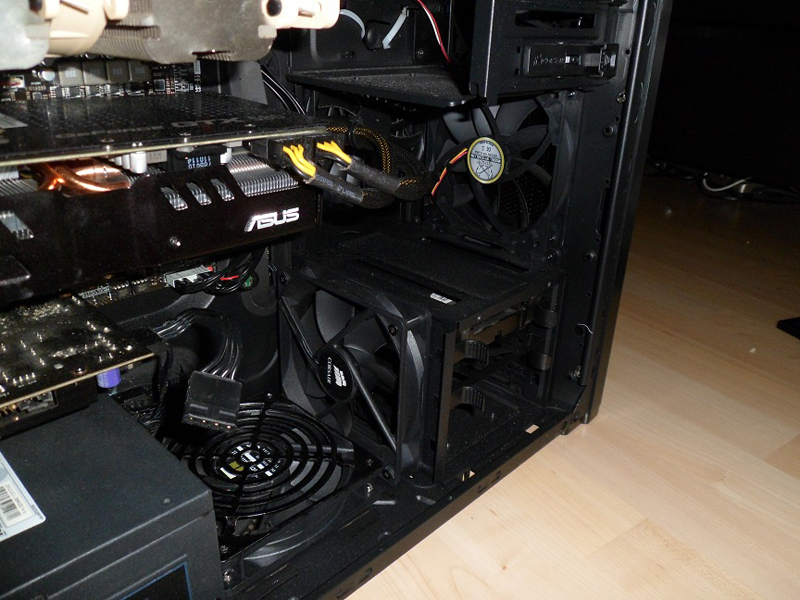 To run push pull on both HDD cages, you will need to have a short graphics card. 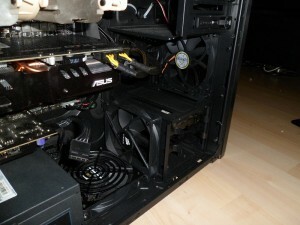 I had to remove one HDD cage altogether to accommodate my ASUS DirectCuII GTX 580 when I assembled the system. 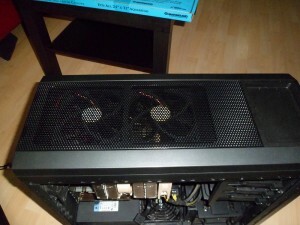 All included intake fans have dust filters, except the side fan which does not. Adding fans to the roof definitely adds to the cooling power of the system. Corsair lets us put 120 or 140 mm fans up here and this case is clearly designed to accommodate the H100 radiator from Corsair. The mesh roof panel is detachable via a clip, the same way the top mesh detaches on the 600T. In addition to all the cooling Corsair provides, I went ahead and added another fan via a Lian Li addon fan box where three of the optical drives were to give me a total of three 120 mm fans up front. It’s worth noting that while all the fans (minus the side fan) come with fan filters, the front fan cover is not detachable like on a 600T or 650D. 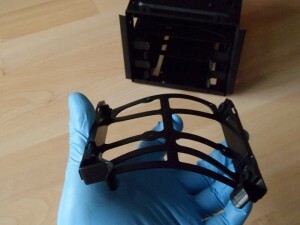 You would have to clean the front air filter with compressed air or remove the front bezel. 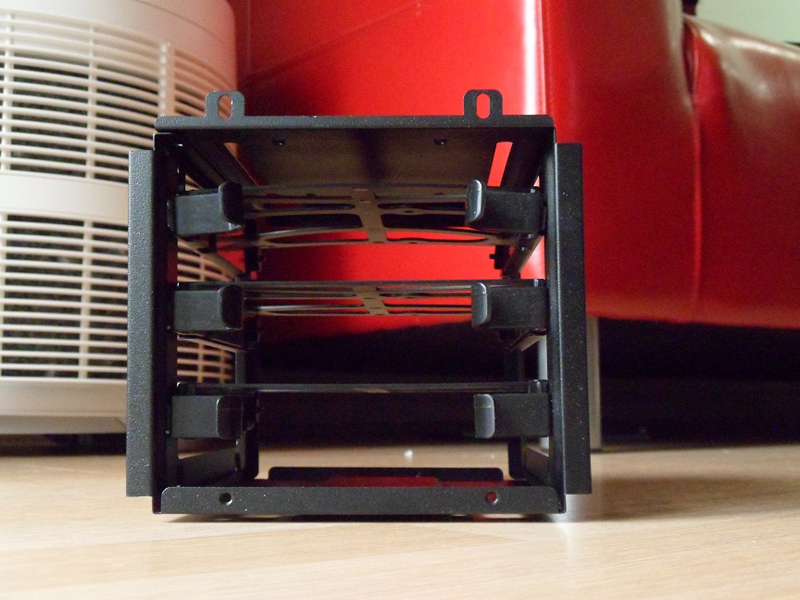 However the bottom air filter for the PSU and bottom intake fan slides out via the back for easy washing. This is a great feature. 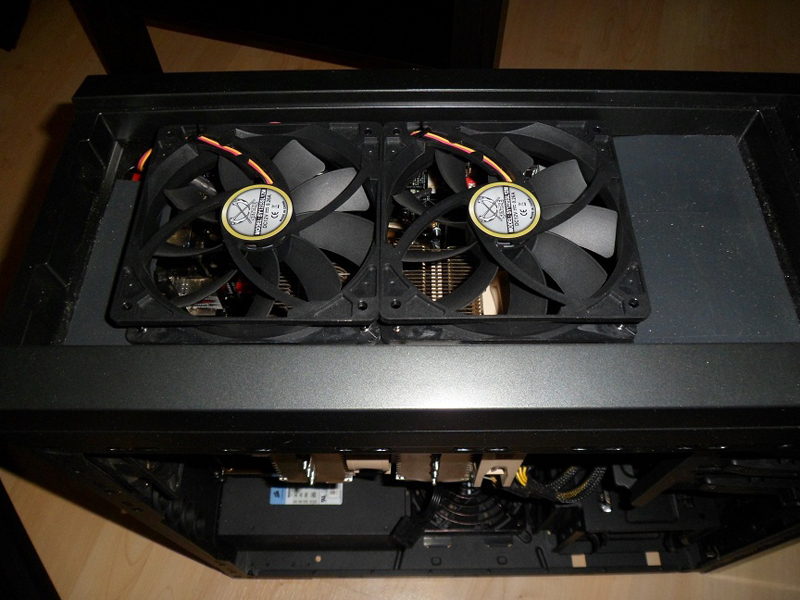 The 500R is a very accommodating case to build in. 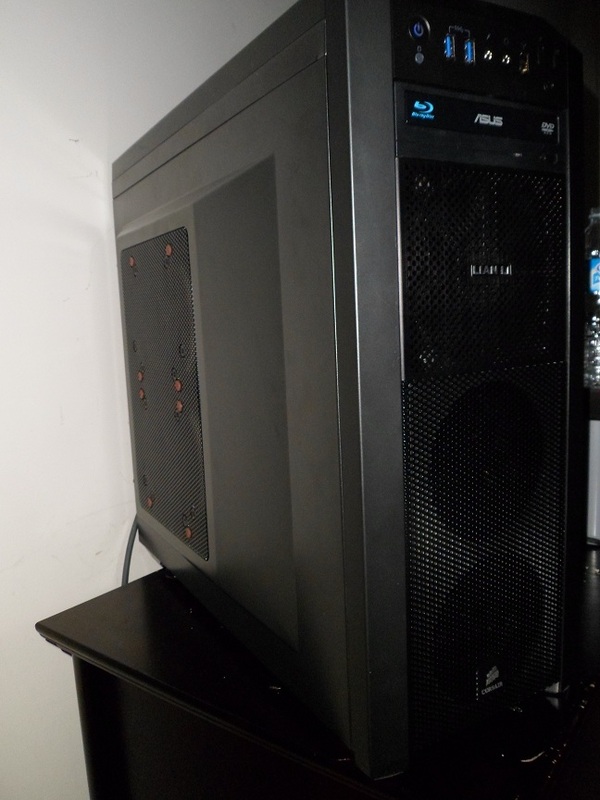 The bowed side panels make installing thick side fans over large CPU coolers a non issue, and wire management in simple. 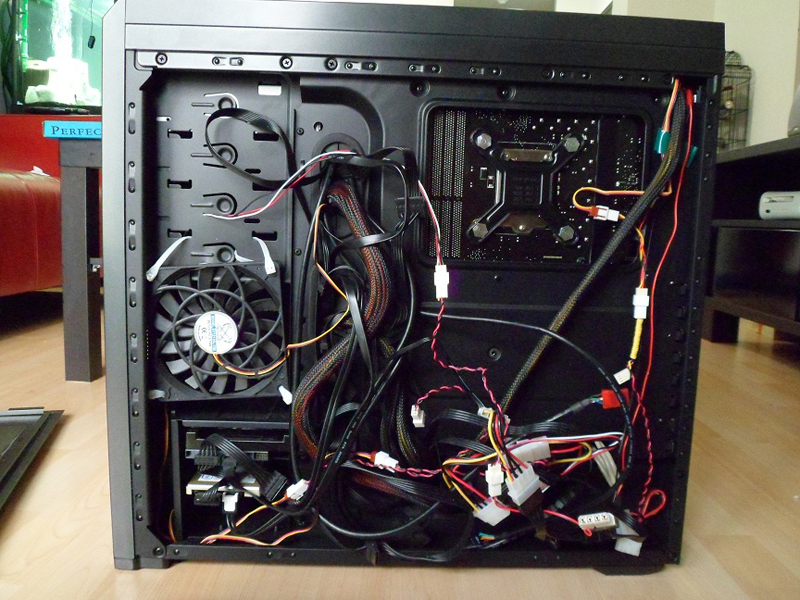 No need to tie cables down tight to the back of the motherboard tray any longer. The door bows out to allow your cabling more space. Not only that, the door screws are ‘captive’. This means that the door screws won’t get lost when you remove the door. They stay on it. 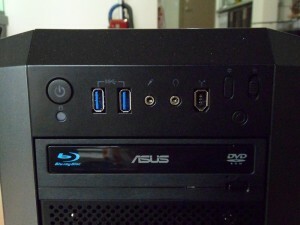 The front I/O panel has a lot of options as well, with the ability to run either USB2 (via included adapter) or USB3. 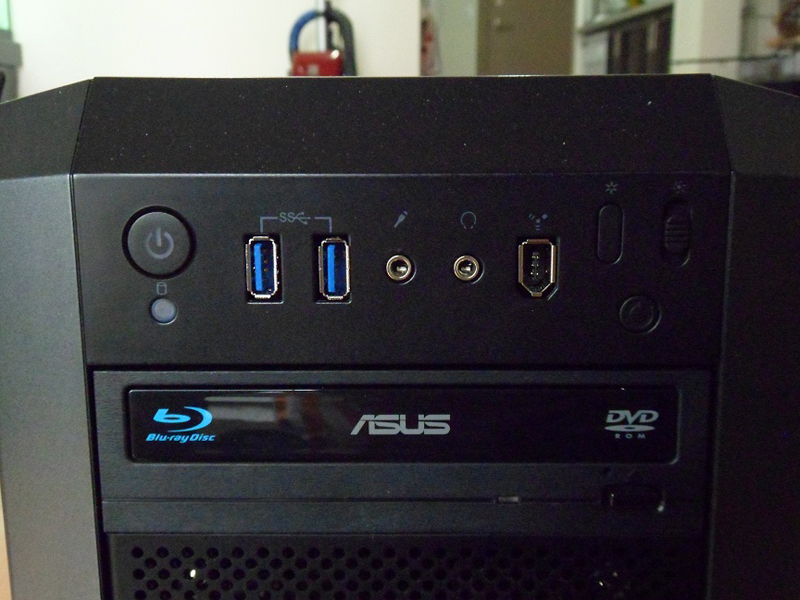 The USB3 header is a proper USB3 header. No passing wires through the back on this case. Moving on we have Firewire, as well as control for fans via a built-in 3-speed fan controller and a switch turn the LEDs for the stock fans on and off. This particular option comes pre-wired from the factory with headers for additional fans to share this function. The built-in fan/LED controller connects to the power supply via a 4-pin molex. Also on the front I/O we get the standard headphone out, mic in, and reset button. 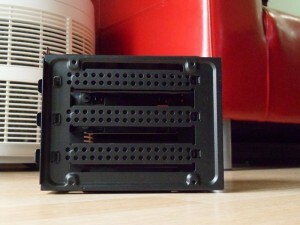 The stock LED for the power button and HDD LED is white to match the white LED fans included with the system. Of course, this is easily remedied if you don’t like white by removing the front bezel and placing your choice of little squares of colored electrical tape over the LEDs. I chose blue to match the blue USB ports next to the light. Corsair also provides a convenient place to put pens, USB keys, a pack of cigarettes, a digital camera or any other small items where you won’t lose them on top of the case. I was able to run the bottom hard drive cage push/pull, install a 120 mm fan in the floor, and still fit my HX850 PSU with no issues when building the system. 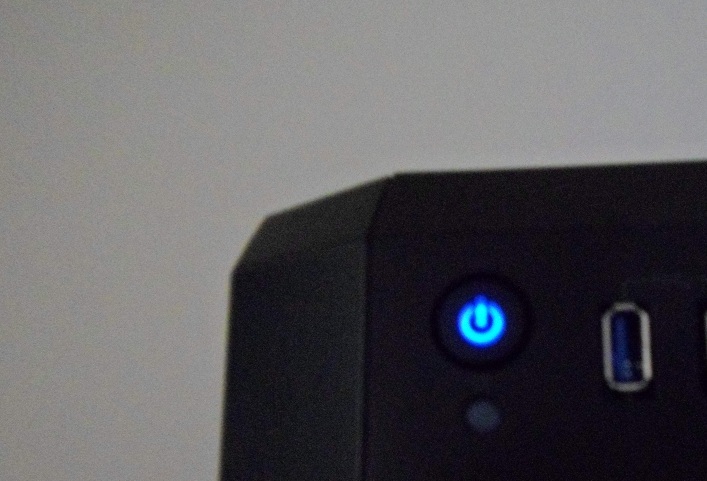 Hard drives and optical drives just slide into place with Corsair’s tool-less system. The hard drive caddys just wrap around a 3.5″ drive and grab on with grommeted metal ‘fingers’ where screws would normally go. Optical drives simply slide into place. Press a button on the side panel and they just slide out. The drive implementation could not be better executed. The SSD had to be screwed into place as it was 2.5″. Corsair’s wire management system made wiring a dream and I completed the build in a relatively short amount of time. 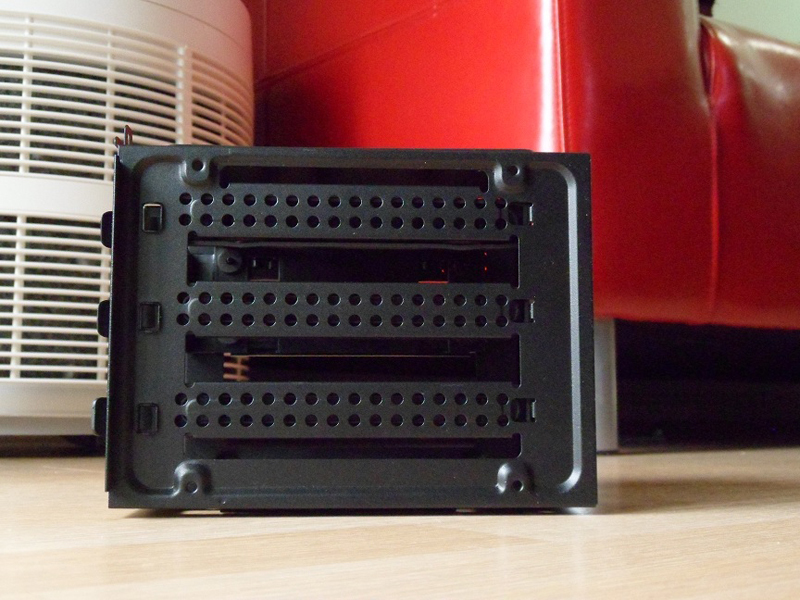 The only issue I have with the case regarding wiring is that if you use an EATX board, and it has right angle SATA ports, the bottom (closer to the motherboard tray) SATA slots will be blocked meaning you lose half your SATA ports. 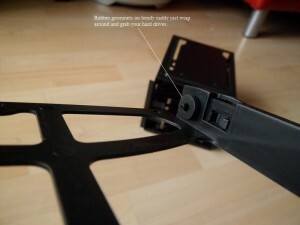 The reason for this issue is that the motherboard tray is indented. This is to take advantage of the extra room due to the bowed out side panel and make sure huge coolers like the NH-D14 will still fit under fat side panel fans when the system is fully assembled. So, make sure you use an ATX board or smaller with this case. 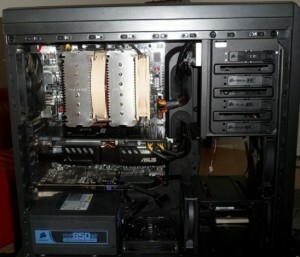 I chose to use two Noctua 140 mm fans for the side panel intakes. This case has great features, great air flow, and only only has one true flaw, and that is that it blocks some SATA ports on EATX boards. Corsair also needs to include more than zero documentation with their cases to help new builders. Otherwise, I think that you’d be hard pressed to find a finer case that retails at this price point. It has equals, but it is an excellent unit. It’s something I’d recommend to anyone looking at getting all of the features you could get out of a pricier case, at a very reasonable price point. It’s durable, it’s easy to build in, and well-designed. Getting the white fans with their LED and speed control pre-wired into the fan controller which you connect to a 4-pin molex was very convenient. Additional fan headers are provided with this built in system so more LED fans can be connected to this as well to serve the same functions of speed control and LED on/off. The bowed side panels made side fans easy to fit and wiring even easier. 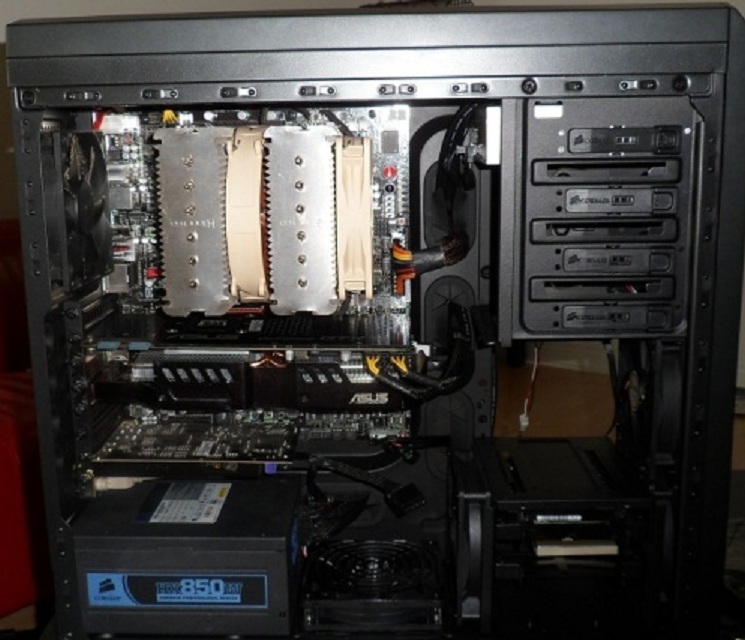 In fact, the wiring and cable management were a walk in the park, even compared to an Obsidian series or Graphite series case. 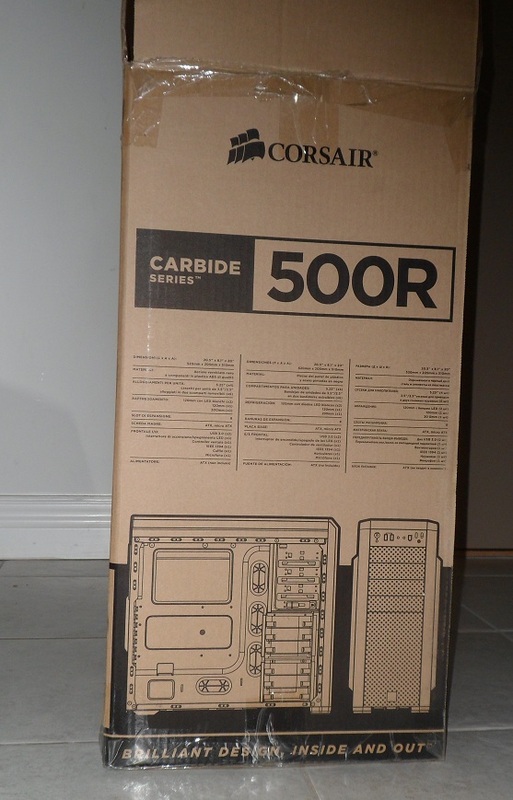 Corsair seems to try to think of everything, and this time, they pretty much did. However, as much as I love this case, I can’t help but wonder why the roof wasn’t made to accommodate three 120 mm fans, which it would, or why the front mesh panel can’t be detached to clean the air filter. I also can’t help wondering why the motherboard tray is sunken so much that it interferes with an EATX board’s SATA ports. Only these reasons keep it from being a perfect case in my eyes. Thanks Earth Dog. 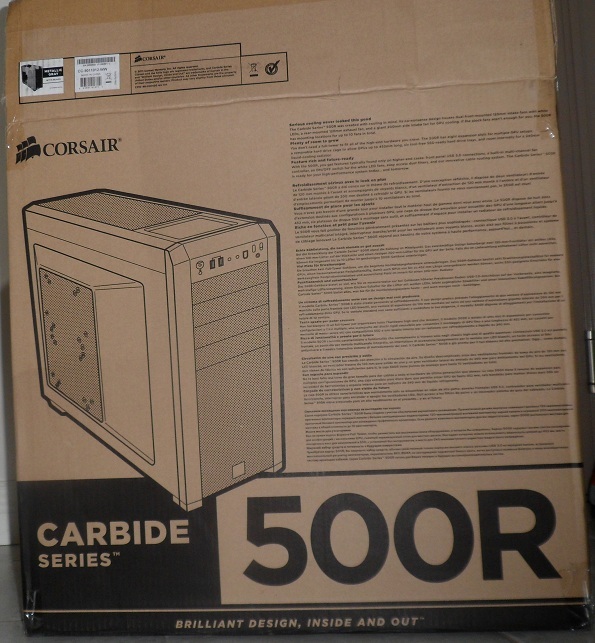 I like this better than all the other Corsair cases personally so I really wanted to do a review of it, despite its few irks. I'd definitely recommend to anybody looking in this price range that they strongly consider this case. *Thanks to the OCF editing team for their help on this one! 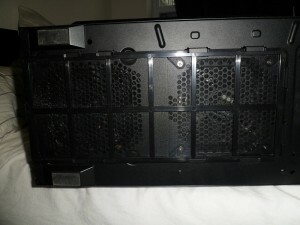 Awesome review, I love cases with four water cooling grommets but I haven't found many that are worthy. 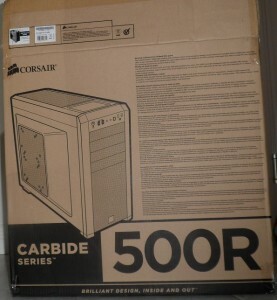 I found a Lian Li, In Win, and this Corsair. 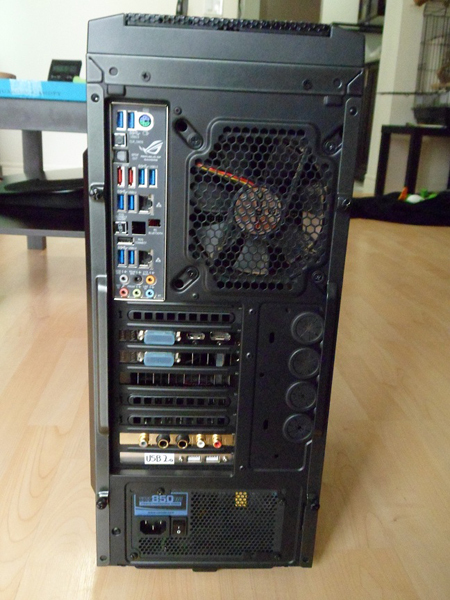 I'd like to see a higher end case with 4 grommets. I think Enough case mfgs make the grommets now that someone would sell them to you and you could carefully dremmel the openings if you wanted to.. if there were a case you wanted lacking them. But I agree, four should be standard. This is hardly the case to start doing it on as it has rather limited RAD placement choices, and RAD choices themselves due to less 'height' over the CPU vs, say, the 650D, which takes a much fatter radiator in the roof. 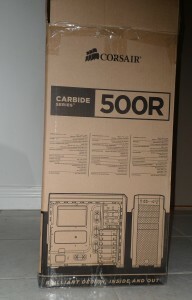 This and the 400R are more designed to perfectly accomodate Corsair's H100 than your average "I did it myself" loop system. 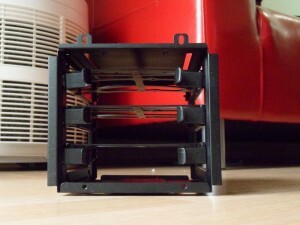 This isn't a knock in my opinion though, given the airflow, this is a great air cooling case and I like it quite a lot. If not for a few quirks I mentioned in the review, it could be pretty well perfect. Meh, I buy grommets from Home Depot and add them to any case I own anyway. 3/4" ID so my cool coils fit through them. My stepped panel drill bit has sure paid for itself over the years! Now off to read the review! **Nice write up, noob! Like the looks of that one! Very nice review. Great case! I almost bought me the white version. Decided to go with the 600T SE. I'm very happy with it to! 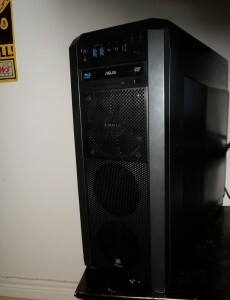 I was leaning towards the mesh panel 600T as well. Four fans beat 2 on the side. I decided I preferred what they'd done with the overall form factor here, the fact that it was so much cheaper, and the unique design with the bowed out side panels. I also calculated I could get about the same amount of air into it using 3 front fans and a bottom fan and only two side intakes rather than the 600's single 200mm front intake. 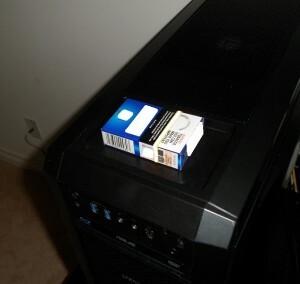 Just a different way to get a similar amount of air in the case.. Overall I think this case's uniqueness as much as it's usability make it a winner. Just that darn EATX SATA port interference. 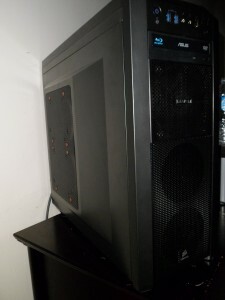 I bought the case for my own rig and decided it was so unique I wanted to write a review and saw there was none so I asked if I could do it :). I'd like to again thank the editing team and support staff for all their hard work on their end getting this edited and published as well. 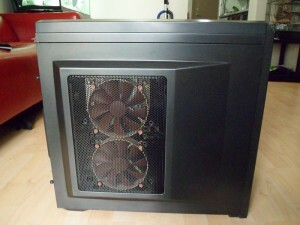 I'm planning on getting this case, but I was wondering about the fan controller. 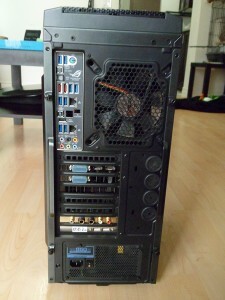 Can it only handle the fans that come with the case, or can more be attached? How does the included fan controller work? Is it just like a 3 position switch? Thanks. Thanks! I'm stuck between the 500R and the 650D. I am guessing both have the same fan controllers...? Hi it's 3 position, it connects to your PSU via a molex which comes out of the controller as do several fan lines (6?). You can connect additional fans to this 'system', and if they are LED, the system will LED on/off them as well as 3 speed control. I don't know the wattage per channel etc as I didn't use it on my build. Same general idea but the 650D one is a bit harder to access under the top hotswap HDD/SSD cover and it has no LED control. By no means is either of these systems any kind of a high tier solution. They do work though. I would judge the 500R particularly for its other good features over the fan/led controller which to me is really sort of just a pair of fuzzy dice in the grand scheme of things. There is no window. The thumbscrews are IMO less of an eyesore vs the latches on the other series cases Corsair has made. As far as the 650D and 500R, I actually sold my 650D and moved to the 500R. I do feel it is a better value for the money personally. 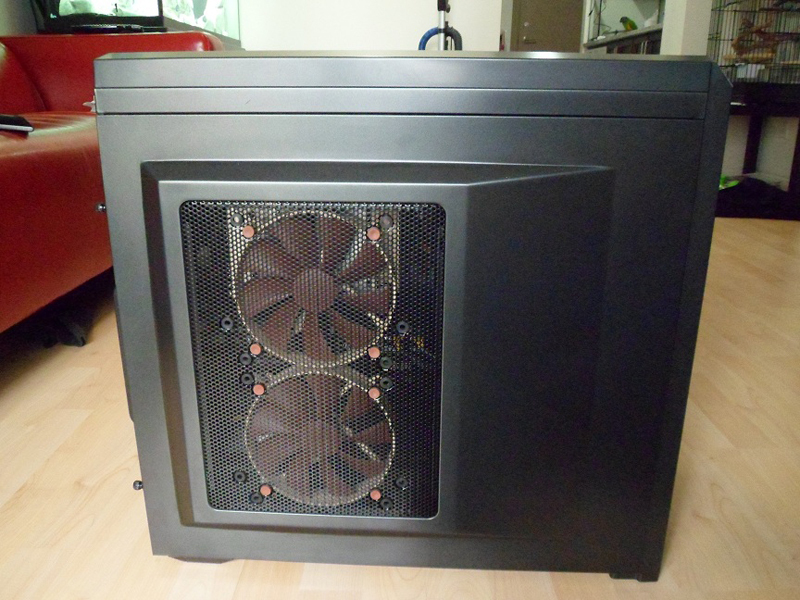 The 600T with the mesh side panel accommodating 4 120mm fans is something else to consider. You could get a significant level of airflow through that one.